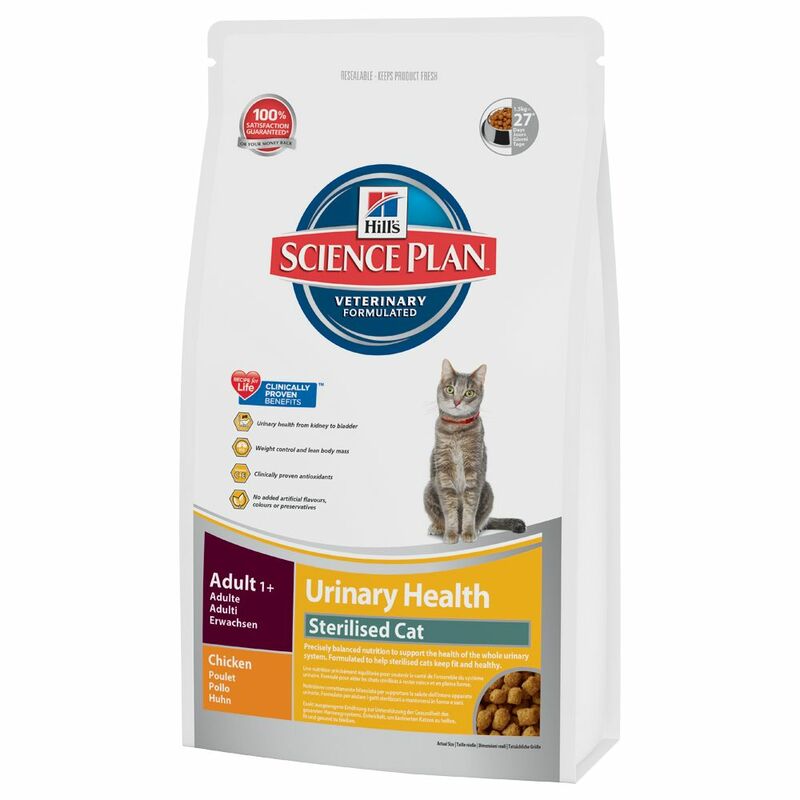 Hill's Science Plan Adult Sterilised Cat Urinary Health – Chicken is a balanced dry food that has been specially developed to meet the needs of adult sterilised cats. This tasty kibble helps to prevent urinary infections from developing and is particularly rich in succulent poultry meat (52%), which appeals to even the fuΒiest cats. Cats that have been neutered are more likely to develop urinary infections and should be fed a prophylactic diet. Healthy kidneys play an important role in your cat's overall wellbeing, as they cleanse blood from waste products. This kibble has an adjusted mineral content, which helps to support healthy kidney function. Your cat's urinary health is also supported with this adjusted mineral content. Hill's Science Plan Adult Sterilised Cat Urinary Health – Chicken contains the perfect combination of vitamins, minerals, energy and protein to keep your cat healthy. This dry food is free from artificial flavours, colours and preservatives. Hill's Science Plan Adult Sterilised Cat Urinary Health – Chicken at a glance: Complete dry food for adult cats aged 1-6 years old Helps to prevent urinary infections: ideal for cats that have been neutered Rich in poultry (52%): delicious poultry appeals to even the fuΒiest of cats Balanced nutrients: the perfect combination of vitamins, minerals, energy and protein Adjusted mineral content: supports healthy kidney function Free from artificial flavours, colours and preservatives.